Everything is big in the Cairngorms - big forests, huge mountain ranges, gigantic birds of prey, vast moorlands and spectacular lochs and rivers. From ski-ing to skinny dipping this National Park has lots to offer, with walking, climbing, cycling and sailing opportunities to choose from, and a wealth of history and heritage to explore. 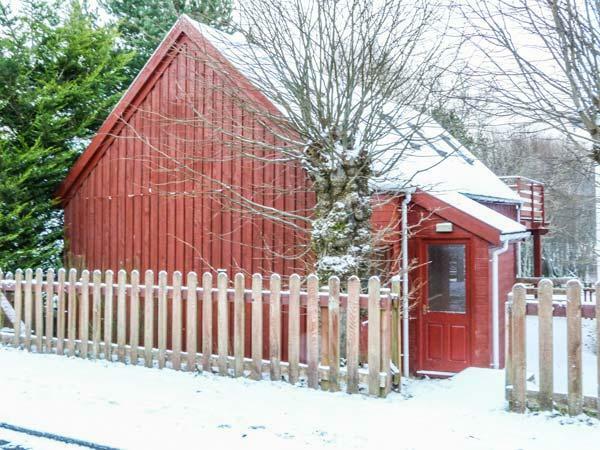 Strathavon Chalet is a detached log cabin on the outskirts of Aviemore in Scotland. The cabin sleeps five people in two bedrooms which are made up of a twin room and a family room with a double and a single bed. There is also a ground floor shower room, a kitchen with a dining area, and a first floor sitting room with an electric fire and a balcony with furniture. Outside there is roadside parking available for one car and shared use of a lawned garden. Strathavon Chalet is in an ideal location for families or friends wanting to get out and about and enjoy walking in this spectacular area. Mar Lodge Estate occupies nearly 8% of the Cairngorms National Park, covering in total 29,380 hectares of some of the most remote and scenic wild land in Scotland, including four of the five highest mountains in the UK. Within its boundaries are fine examples of classic features of a Highland landscape: remnants of the ancient Caledonian pine forest, heather moorland, juniper scrub and a part of the high Cairngorm plateau. The estate is recognised as one of the most important nature conservation landscapes in the British Isles. Situated six miles from Braemar, and close to Mar Lodge, Creag Bhalg and Claybokie form their own exclusive small estate, comprising two exquisite houses, private in the extreme and beautiful in every respect. . Both houses can be let separately or larger groups may wish to book both. Uninterrupted views across the River Dee and Glen Eye and minutes away from Linn of Dee, Deeside, Balmoral and Skiing at Glenshee. There is fishing available and access to the Cairngorms is easy. Beautifully furnished, these must be among the most comfortable lodges in Scotland. We are open all year round for you to enjoy the Picturesque Highlands with lots to do nearby, come rain or shine (or even snow) The Chalet is Brand New 2014 large and very spacious , fully furnished with 2 bedrooms (sleeps 2-6)with an abundance of storage space.It also has a very nice outside area to relax. ALL GAS AND ELECTRICITY ARE INCLUDED IN RENTAL CHARGE. ALSO INCLUDED IS ALL YOUR BEDDING AND TOWELS. You will find the Chalet is fully equipped for all your day to day needs.If you should have young young ones a Travel Cot High Chair Baby Bath and Potty can be supplied. (See Picture ). It is nestled close to the magnificent River Spey.Boat of Garten(or affectionately known as The Osprey Village ) is an area of outstanding beauty centrally located in the Highlands of Scotland and is a perfect place from which to explore the delights of the Highlands or simply relax and enjoy the serenity and tranquillity of the surroundings. Boat of Garten is set amongst the heather clad hills and native woodland of the Cairngorm National Park. The chalet is perfect for a Highland Break or as a base for fishing,golfing,skiing,walking,cycling or just wildlife watching. Boat of Garten has abundant wildlife,magnificent scenery,many sporting and leisure activities and a traditional and friendly Highland welcome awaits you. Play the local James Braid designed 18 hole golf course.This is a beautiful heathland golf course set alongside the River Spey. he called this "his prettiest" with fairways lined with birch and Rowan trees. This course is also known as " the Gleneagles of the North ". Unique bird watching opportunities are abound including the local Osprey Centre. there are tranquil woods and dramatic hillsides to walk,climb or ski. Cycle on excellent tracks and quiet roads. The very nearby Cairngorm Mountain is Britain's 6th highest mountain and an ancient glacial landscape.No matter what the weather, the mountain will inspire you. The Funicular Cairngorm mountain Railway is a safe and comfortable way for visitors of all ages and ability to enjoy a journey of 1097 metres above sea level to experience the impact of altitude. You can chose to walk up to the summit and then take the train down. Whichever way you choose to explore this mountain landscape it will reward you with its spectacular views,weather, flora and fauna. The Cairngorm Reindeer Centre is very close by . here you can visit Britains only herd of free ranging reindeer. Living in the Cairngorm Mountains, these friendly animals are delightful to all to see. Visits to the reindeer in the mountains leave throughout the year. Follow the herder as you make your way up to the mountain enclosure,walk amongst the reindeer,stroking and feeding them. Situated in the centre of the Cairngorm National Park, you will also enjoy the beautiful views of the Cairngorm Mountains and walk through forest and over moorland. Watersports may be a thing that you enjoy. If so the Cairngorm National Park has some of the cleanest rivers and lochs in Europe, and what a better way to enjoy them by messing around in them !!!! 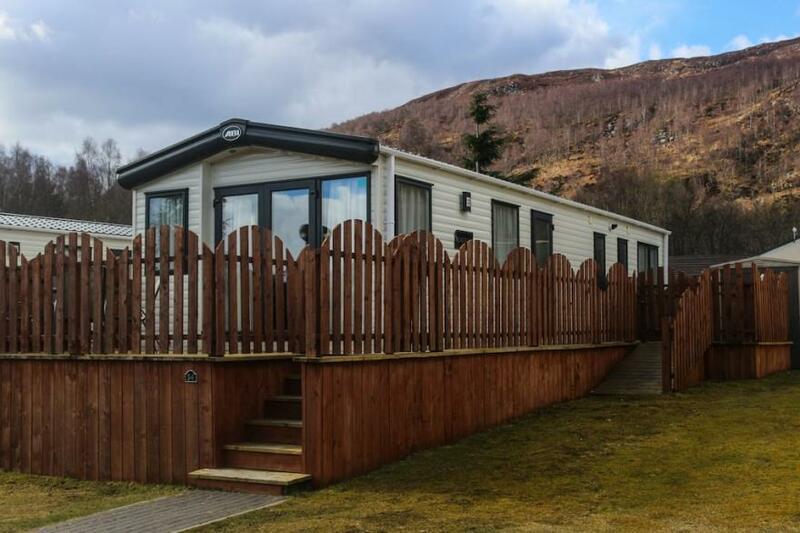 Fishing,sailing,windsurfing,paddle-sports,rafting swimming or the excitement of gorge walking are all within easy reach of the Boat of Garten Holiday Park. It boosts two dedicated watersport centres , Loch Insh and Loch Morlich. Each has its own individual character and features,but both are unsurpassed by the stunning beauty of their natural surroundings. Viewing wildlife from the water is a great experience. Tthe majestic rivers of Spey and the Dee flow through the National Park on their way to the sea and are two of the finest salmon and sea trout rivers in Scotland,if not the world. And also remember,its the water from these very special rivers and tributaries that goes into making some of the finest whisky in the world. Cycling in the Cairngorm National Park is quiet and peaceful. the roads are not busy and the National Cycle Network crosses almost the entire area and includes 64km of off road routes. Cycling and mountain biking in the Cairngorm national Park gives you every opportunity to enjoy your own experiences. Its not all easy pedalling as it has some of the best mountain bike trails in Scotland. Outside Activities in the Cairngorm National Park are in abundance including Aviemore,Angus Glens,Royal Deeside, Glenlivet,Atholl and Glenshee areas are famous for its challenging landscapes and even more challenging outdoor activities. But most people who visited are so enchanted by the surroundings that walking is a must at once during their stay. There are over 280km of footpaths across the area that pass through every type of walking route imaginable from moor and woodland,riverside to loch edge and even beautiful farmland. For those who wish to have a wee dram do not forget the Glenlivet Distillery Centre. Winner of Best Visitor Attraction at 2013. When staying in the Cairngorm National Park, a visit to Glenvilet is a must . The Glenlivet admission and tour is free and yes does include a dram from a range of the Glenlivets. Landmark Forest Adventure Park will give you an amazing day of Fun, Discovery Exploration and Adventure.Winner of Scotlands Perfect Family Day Out Award it hosts a full range of attractions for all ages. Set in the beautiful surroundings of an ancient Scots Pinewoodland. When hunger threatens ,enjoy a fabulous meal and fresh coffee or a locally sourced burger,home-made food or snacks. Great food and fantastic value so leave the picnic for another day and treat yourself. Castles and Historic within the Cairngorm National Park have had an important role to play in much of Scotlands History-from Royal Fueds to Bloody Battles . There are many sites which tell the stories dotted all around the Cairngorm National Park--at some you may to use your imagination a little more than others,but they all delve into the history of this area. Regards to eating within the Cairngorm National Park, you have an abundance of award winning restaurants catering for every taste. If it is fine dining,a quick snack or a lazy Sunday Lunch you will not be disappointed by the choice of restaurants. There are great places for your family to eat and relax. If you are looking for an afternoon tea,or cake and coffee after a day out on the hills check out the places to eat in and around the Cairngorm National Park. In Boat of Garten itself there are two award winning places. One of the immediately opposite the park entrance and another approx 5min walk away which is Boat Hotel Osprey Bistro and Bar. On the shores of Loch Insh there is the Boathouse Restaurant voted as one of the top 100 top views from any restaurant in Europe. It has a 100 seater log cabin and glass fronted balcony containing extra seating and enjoys amazing sunsets most evenings. As you will see from reading this Boat of Garten is the ideal base for touring the beautiful Highlands of Scotland. The City of Inverness is is only 35 mins away. Aviemore is just 4 miles away. The surrounding area area is perfect for picnics . You can see the Ospreys and Deer, visit the Highland Wildlife Park, Landmark Activities Centre, or just have fun on the beaches of Loch Insh and Morlich. Skiing and snowspor4ts are available nearby and last but not least the splendour of The Cairngorm Mountains. 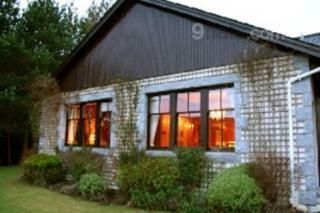 The lodge is situated in an enviable position overlooking the Cairngorm Mountains and River Spey. It is only a 5 minute walk to the shops/bars/cafes and restaurants as well as all the great outdoors within the Cairngorms National Park. The Kitchen area is open plan to the lounge and fully equipped for your cooking requirements with microwave, coffee machine, double toaster, kettle, pots and pans, glassware, crockery, cutlery and a full complement of utensils. There is also a full sized integrated fridge/freezer, gas hob with four burners, oven and grill. There is a separate comfortable dining area with seating for 4 people. The lounge area has a 6 seater corner sofa looking towards a real flame effect electric fan fire with mantle surround. The spacious lounge is equipped with a 32” flat screen HD TV, a DVD player and Sky HD box for your enjoyment. You will find a selection of DVD’s for both the kids & adults to enjoy for cosy days/nights in. The lodge also boasts built in Bluetooth connectivity with speakers built into the ceiling and USB charging points are built into the sockets within the lounge and both bedrooms. Free, unlimited wireless broadband Wi-Fi throughout the lodge for your exclusive use (so no drop in connection). The en-suite master bedroom has a comfortable king size bed, double wardrobe, shelving, seat, wall mirror with chest of drawers below, hairdryer and heat mat for straightening irons. This bedroom has the luxury of having a mains pressure shower along with a bath tub, heated towel rail and wall cabinet with mirror. The second bedroom has two single beds which can be pushed together to make a double room. It benefits from a wardrobe space for storage and vanity mirror. There is a selection of family games located in the wardrobe for use of the guests. The family bathroom also has a mains pressure shower along with ample shelving for towels and incidentals. A heated towel rail, shaving point and a wall cabinet with a mirror is also there for your convenience. The Lodge is fully insulated, double glazed and has gas central heating throughout. All gas & electricity is included in the rental price. The Lodge benefits from two separate terrace areas, one at the front and the other on the side of the property. From the lounge the patio door leads out to the private decking area at the front and the main entrance has a larger patio area for dining al fresco with comfortable seating. From both terraces you can sit and admire the tranquil River Spey and the spectacular views of the Cairngorm Mountains while you enjoy a glass of wine or enjoy the peacefulness of the location. We also provide towels and linen during your stay at no extra cost as well as essential toiletries. 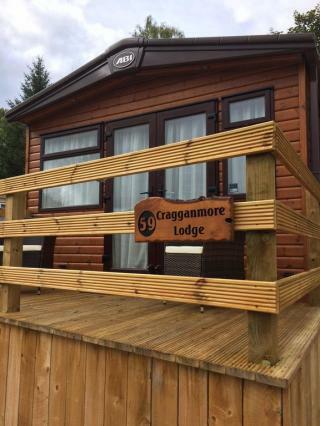 Cragganmore Lodge is located within the picturesque Aviemore Holiday Park which is very close to the village centre (approx 10mins walk). The Park provides a bar with entertainment on some of the nights as well as lunch and dinner menus, a nail and beauty salon, a children’s play area and inclusive free fishing rights on the river Spey which contains mainly salmon and trout. There is also a laundrette on site (fee payable). Aviemore village boasts a vast array of shops from Tesco and M&S supermarkets, to local butcher, bakers, retro sweet shop and outdoor shops. There is also a good selection of restaurants if you don’t wish to cook at the Lodge and plenty of vibrant bars for your evening entertainment, all within walking distance from the Lodge. The railway station is a 10 minute walk from the lodge. Inverness is 30 miles north of Aviemore by car. For the more adventurous, Aviemore is a hub of different levels of activities. Landmark outdoor adventure park which is roughly 6 miles from the lodge for kids of all ages (Tesco vouchers are accepted here), golfing, hiking, cycling, skiing, climbing, kayaking, tree adventure climbing within the Rothiemurchus estate in Cairngorm National Park and the surrounding areas. 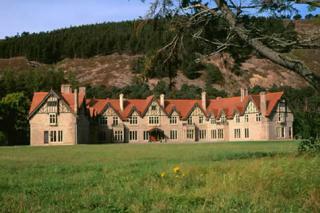 Rothiemurchus is adjacent from the Lodge itself. 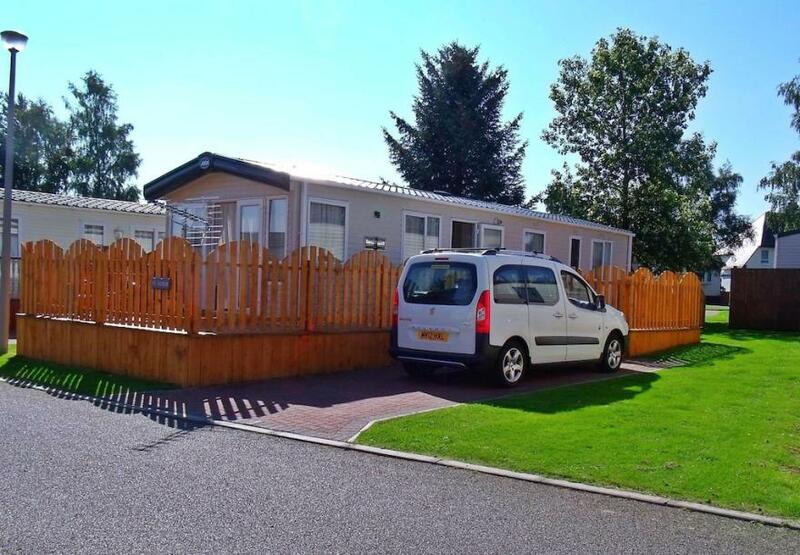 The ABI Sunningdale Static Holiday Home, provides all year round Self catering accommodation for up to 4 people. 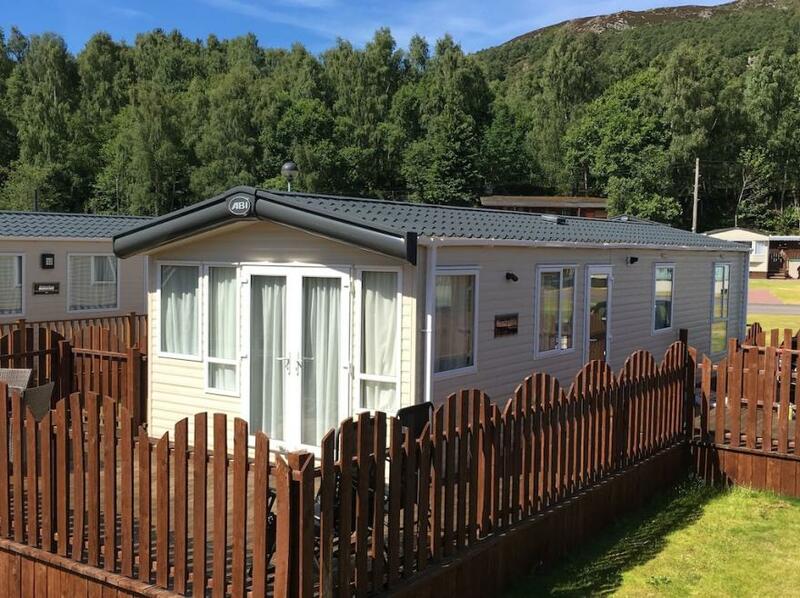 It is located in Aviemore Holiday Park, in a quiet location close to all amenities which are within 10 minutes walk to the town centre where you will find a wide range of shops and restaurants. The home is fully insulated with double glazing & central heating throughout providing modern, warm accommodation all year round. There are 2 bedrooms, one double with ensuite facilties including a bath. The other bedroom has twin beds There is also a family WC/Shower room. The holiday home has an open plan living/modern fully fitted kitchen and dining area. Facilities include a 32" flat screen digital TV, DVD player, a kitchen area with cooker, fridge/freezer, microwave oven and table and chairs to seat four people, We also offer a number of extra's to make your stay more enjoyable, including a selection of board games. Outside there is a large private decking area with patio table and chairs and an off road loc-bloc driveway which can accommodate one car. Bedding & towels are supplied. 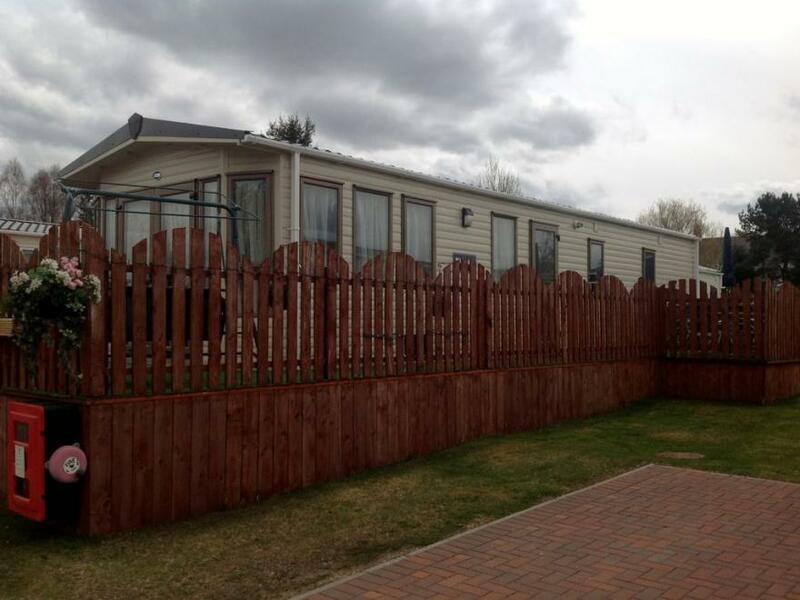 Welcome to our holiday lodge rental page. Here you can view our lovely new holiday lodge located in the village of, Boat of Garten, in the heart of the Cairngorms National Park. A quiet place, known as the Osprey Village, only five minutes from Aviemore via steam train or cycle path. Play the superb James Braid 18-hole golf course or fish the river Spey. Wonderful bird watching opportunities, tranquil woods and dramatic hillsides to walk, climb or ski are within easy reach. Situated in a quiet part of this four star park, this lodge is perfect for people looking to get away from it all and explore this beautiful area. Sleeps: 6 Bathrooms: 2 Bedrooms: 3 One double bed and 2 bedrooms with 2 single beds. Pet friendly Large living area, two decking areas with patio set and a slabbed area to the rear The lodge comes complete with a new TV with free view, DVD player, toaster, microwave, kettle, slow cooker, cutlery, crockery and pans. Linen is provided but we ask that you bring your own towels. Dining is for four at the main table but two extra portable tables are provided for use. Central heating throughout with additional electric heater - all gas and electricity costs are included. There is also a well stocked, reasonably priced shop and cafe at the entrance to the park with a laundry in the park. There is a three nights minimum stay with check in after 1600 and check out before 1000.